Fischer, Wolfgang Chr. (2004) Structure of the Australian retail trade industry. In: Fischer, Wolfgang Chr., (ed.) 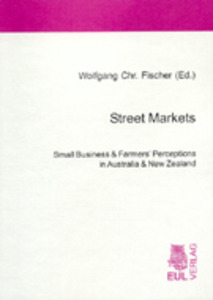 Street Markets: small business & farmers' perceptions in Australia & New Zealand. Josef Eul Verlag , Koln, Germany, pp. 3-20. [Extract] The only continent united as one nation, the largest island on the planet, Australia, like New Zealand also holds the distinction of being both one of the world's most urbanised and most sparsely populated countries (Shu 1994, 9). This means a relatively low number of people per square kilometre of land. If Australia's population of roughly 20 million people were evenly distributed across the nation, then this would be a very sparsely populated country. It is remarkable that the Australian population is tremendously concentrated into a small number of coastal, capital cities that is more than 80% of Australians live within 50 miles of the coast and more than 85% are urbanites. Historically Australia's settlement pattern has been determined profoundly by environmental factors rendering most of the nation's interior inhospitable to major population centres (Sher 1994,10).